After experimenting with baking whole chicken, I tried something different this time and cooked the chicken by steaming. Steaming is a very nice way for cooking a whole chicken, and has several advantages over other cooking methods. Compared to baking, steaming gives the food more moisture and is not as easy to overcook. It is better than boiling because you do not lose flavor and nutrients to the boiling liquid. The steps of this dish is fairly straight-forward. 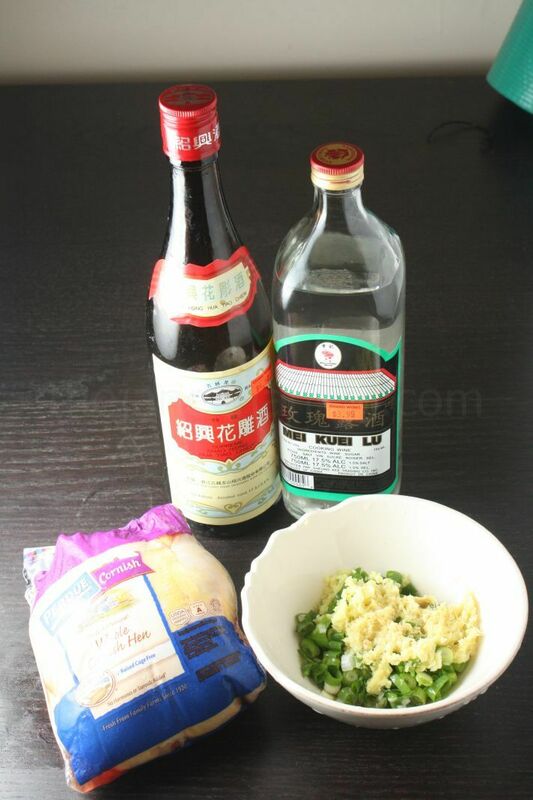 First, the chicken is marinated with wine, ginger and scallion. Then, it is steamed over boiling water for about 22 minutes. At the end, pour the marinate and chicken juices on top. 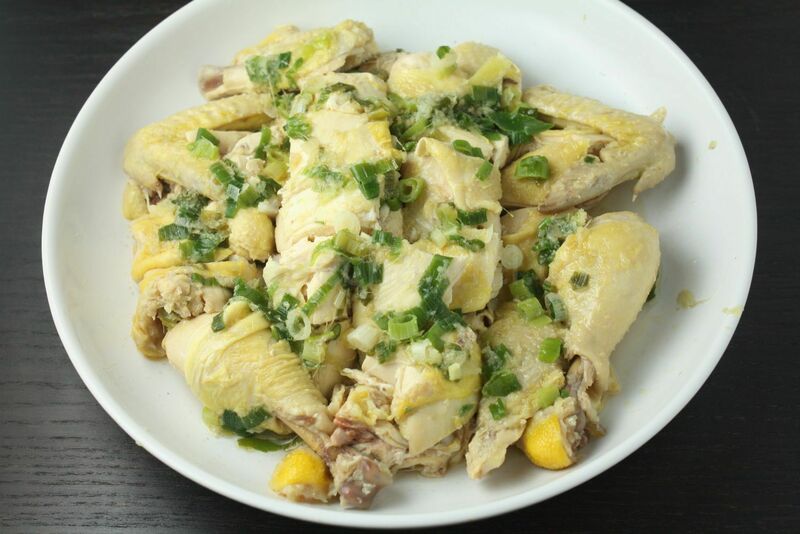 The steaming method retains flavor, moistness and tenderness of the meat, which is why ginger and scallions chicken is always a popular in Chinese cuisine. Pat the hen dry with paper towels. Season with salt. Combine Hua Diao, rose wine, scallions and ginger. 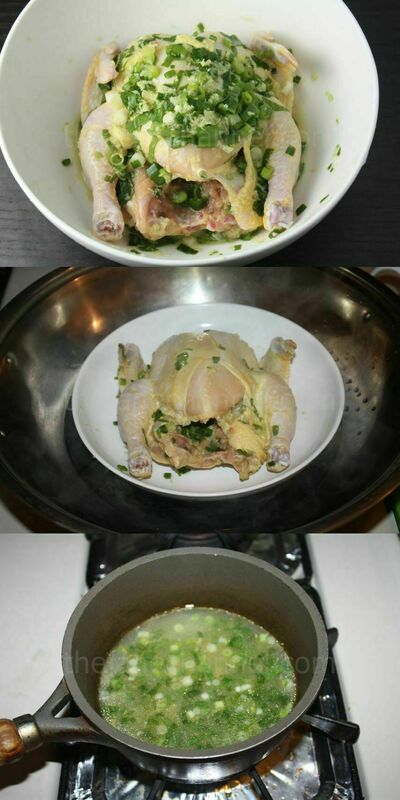 Marinate the chicken for 20-30 minutes. Place chicken on a plate and set the plate on top of a wide-mouth wok or large skillet as the base with a metal stand to balance. (The stand can be found at Chinese supermarkets). Make sure the water is about 1 inch beneath the plate. Cover and steam over boiling water for 22 minutes or until cooked. Remove and reserve the liquid in a bowl. Combine the liquid with the sauce ingredient above. Bring it to boil and pour over the chicken. Wow this looks sooo good! Did you use a traditional Chinese steamer?